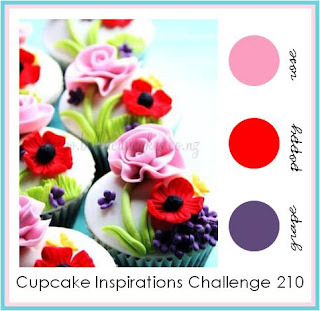 I'm here today with another lovely color challenge with the Sweeties from the Cupcake Inspirations Challenge. I do love picking the yummy cupcakes for our challenges each week and this week's inspiration is no exception! Check out these delicious colors! Our sponsor this week is Downtown Tape and they were generous to send over samples for our team. I've used these tapes before (on this card) - Skinny in the City and Blissful Bel-Air. I added the tape over some Whisper White card stock that I embossed with the Vine Street embossing plate. Then I added some pretty blooms from Secret Garden (Regal Rose), Fabulous Florets (Poppy Parade), and Perfectly Preserved (Elegant Eggplant). I added the sentiment from Oh, Hello, matted with some Poppy Parade card stock. I'm loving the bold colors against the crisp white! Fantastic card, Nina! I love the textured background.